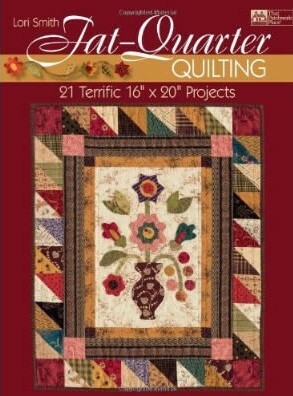 Fat-Quarter quilting by Lori Smith, published in 2009 by That Patchwork Place! It's a somewhat of an older book, but a must have in my opinion! What a great book! Every time I look through it, I feel inspired! 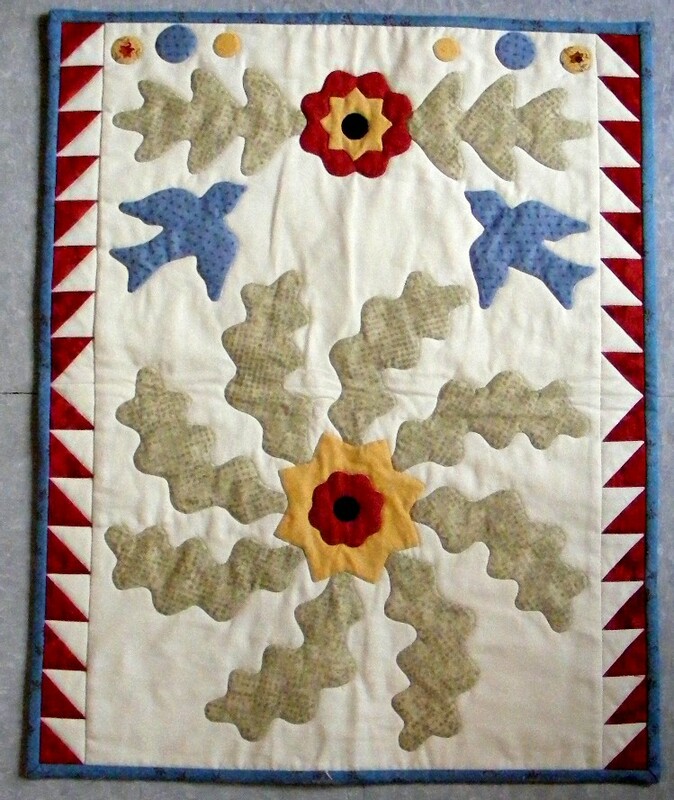 It has both hand applique and machine pieced projects! All are lovely! I love this book so much that I have tailored a hand applique class that I am presently giving at the Shoppe, Fibre Junction. Every month, I work on a technique that is associated with a quilt in the book. This quilt to me is what I consider a "made do" quilt. I used all scraps! Well, except for the background, which I needed a fat quarter, the fabrics comes from my hand applique scrap bin! The binding is a left over from my Rural Jardin quilt! I had just enough left to bind it! Your birds quilt is beautiful! I have this book, too, and I love it. It's nice to see you back posting again! Wow, that looks like a great book. That little birds in the air project is adorable. I really should start a few scrap eating projects like that -- my bin overfloweth! It looks like a great book. It is so easy to get caught up in the fabulous new fabrics, but I just love great scrap quilts. I enjoy the older books more than the new, but I am a newbie, so the old ones are new to me. I have seen that book. don't own it but it does have some pretty things in it. Great little quilt using your stash. This is such a good book-there is nothing in it that I don't want to make. I can't say that for very many books. This is so well done, you are a master in quilting. 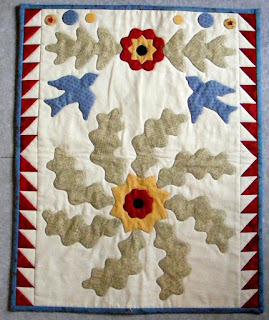 Lori Smith's patterns with applique involved always look good. I have that book and have not made any of the quilts. Your quilt makes me want to revisit the book and make some quilt plans.